This is a great model of a German PzKpfw III Tank, the Panzerkampfwagen III, more commonly referred to as the Panzer III built in a John Walker & Sons Limited Scotch bottle. All the pieces are amazingly detailed and painted in army green. The original tank The tank was made 1934 - 1943 and was equipped with a 55 ml gun. This tank has a single cross on one side. There is a man in a dark green uniform in the opening of the tank with a large black item at his face. Probably this is a pair of binoculars but the way it is positioned makes it look like he is taking a drink from a large black bottle. 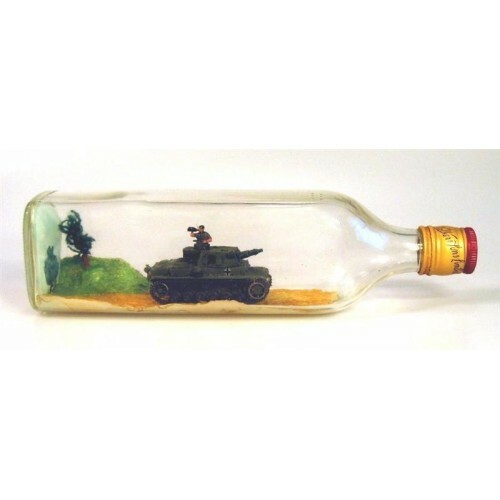 The tank is traveling on a light colored road. In the rear of the bottle is a small hill covered in green grass and a single small tree near the top and a second tree pained on the bottom of the bottle against a light blue background. This scene is nicely portrayed and shows the age and the wear and tear of battle in the soldiers uniform and on the tank with even mud on the tires. The bottle is sealed with the original screw cap. Approx. Bottle Size 10 1/2" x 3"